A man accused of an armed robbery at Gleneagles Hotel told a court he was "looking for something to steal" on an earlier visit to the luxury complex. But Richard Fleming denied returning to the luxury Perthshire resort to take Rolex watches worth more than £500,000 on 27 June last year. The 42-year-old told the High Court in Edinburgh he was buying drugs in Glasgow on the day of the armed raid. Mr Fleming, of London, was giving evidence on the ninth day of the trial. He said that on the day he visited Gleneagles three weeks before the raid, he robbed two houses in St Andrews, Fife and had stolen designer goods. Asked what he did at the hotel on 12 June 2017, he said: "I was looking for something to steal. I was looking for locker room lockers." Giving evidence, Mr Fleming said that before his arrest he lived in London with his partner and daughter, but was born in Glasgow and still had family in the city. Mr Fleming told the court he had been in Scotland on a number of occasions in June 2017 to buy drugs. He said he could not read or write and knew nothing about the raid on Gleneagles until he was arrested. Prosecution lawyer Jane Farquharson showed Mr Fleming and the jury CCTV footage of the accused at the ticket office at Glasgow Central station. 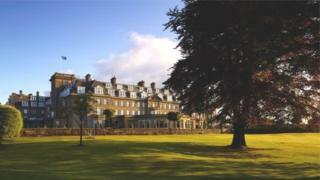 The image was captured following the robbery at Gleneagles. In the footage, Mr Fleming can be seen showing off a watch to people in the queue for tickets. Ms Farquharson asked the accused whether the watch was one of the Rolex timepieces that had been taken from Gleneagles. He replied: "No. That's ridiculous. The police in Dundee took it off me. My missus gave it to me as a gift. She saved up for months to give it to me." When Ms Farquharson asked Mr Fleming whether he was the man with a gun, a machete and the west of Scotland accent that threatened Gleneagles staff members during the robbery, he replied: "I've never held a machete in my life. That's ridiculous." Mr Fleming pleads not guilty to charges which allege he, and others, threatened Gleneagles employees with a gun, hammers and a machete at the hotel.